Lacrosse has its origins in a tribal game played by all eastern Woodlands Native Americans and by some Plains Indians tribes in what is now Canada. The game has been modernized extensively by European immigrants to create its current form. Modern day lacrosse descends from and resembles games played by various Native American communities. These include games called dehuntshigwa’es in Onondaga (“men hit a rounded object”), da-nah-wah’uwsdi in Eastern Cherokee (“little war”), Tewaarathon in Mohawk language (“little brother of war”), baaga`adowe in Ojibwe (“bump hips”) and kabocha-toli in Choctaw language (“stick-ball”). Lacrosse is one of the youngest team sports in North America. There is evidence that a version of lacrosse originated in Mesoamerica or canada as early as the 17th century. Native American lacrosse was played throughout modern Canada, but was most popular around the Great Lakes, Mid-Atlantic seaboard, and American South. 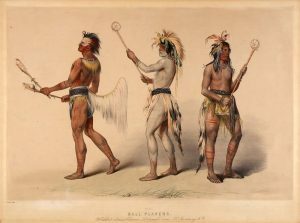 “An Indian Ball-Play” by George Catlin, circa 1846-1850, Choctaw Indians. Native American ball games often involved hundreds of players. Rules for these games were decided on the day before. Generally there was no out-of-bounds, and the ball could not be touched with the hands. The goals would be selected as large rocks or trees; in later years golden posts were used. Playing time was often from sun up until sun down. The game began with the ball being hit against the refs head and the two sides rushing to capture it. Because of the large number of players involved, these games generally tended to involve a huge mob of players swarming the ball and slowly moving across the field. Passing the ball was thought of as a trick, and it was seen as cowardly to dodge an opponent. Lacrosse traditionally had many different purposes. Some games were played to settle inter-tribal disputes. This function was essential to keeping the Six Nations of the Iroquois together. Lacrosse was also played to toughen young warriors for combat, for recreation, as part of festivals, and for the bets involved. Finally, lacrosse was played for religious reasons: “for the pleasure of the Creator” and to collectively pray for something.